Homemade paper fans are fun to make and useful for keeping cool on a warm day. Since they can be decorated in any number of ways, they are popular for use as party favors or small handmade gifts. 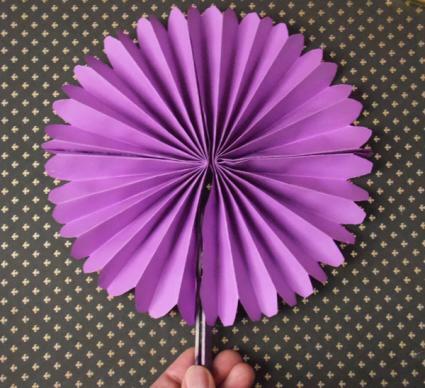 This basic paper fan is the perfect project for kids to make on a hot summer day. They can use purchased decorative paper or draw on plain white copy paper with crayons, markers, or colored pencils. Thicker paper makes a sturdier fan, so feel free to use cardstock if you have it available. Fold the bottom of your paper up approximately two inches to begin making a handle for your fan. 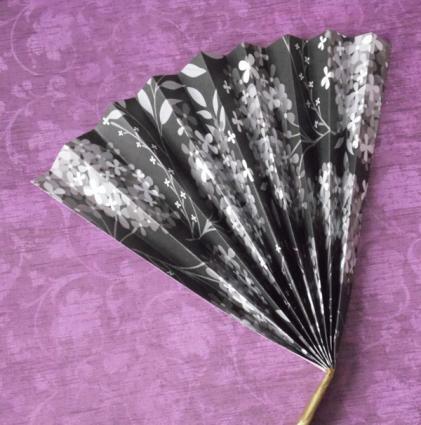 Wrap the handle of your fan with washi tape in the color or pattern of your choice. This will ensure that the fan does not come unfolded when you set it down. This paper fan is a slightly more complex version of the basic paper fan, but the rounded shape gives it a festive appearance. Again, thicker paper works best for creating a sturdy fan that can be used again and again. Accordion fold your paper as you did for the first fan project. Fold the paper in 1/2" increments, using a ruler to measure if desired. Use your scissors to round the corners of each end of the folded paper. Fold the first accordion folded paper in half. Hot glue it to the other folded accordion piece of paper. Hot glue one side of the paper to the popsicle stick. It's important to be certain the "handle" of the fan will be toward the open end of the folded paper accordion. Repeat Step 4 with the other side of the accordion and the remaining popsicle stick. When the glue is dry, use the sticks to open your fan into a circle shape. To store it in a backpack or purse, tie a small ribbon around the closed fan. When you receive decorative or handmade greeting cards in the mail, do you often think the designs are too pretty to throw away? Here's a simple DIY project to recycle one of your favorites. Paint your wooden paint stirrer with acrylic paint in the color of your choice. If desired, paint the back of your card so the print doesn't show on your finished fan. When the stirrer is dry, open your greeting card. Glue the stirrer to the inside of the card. 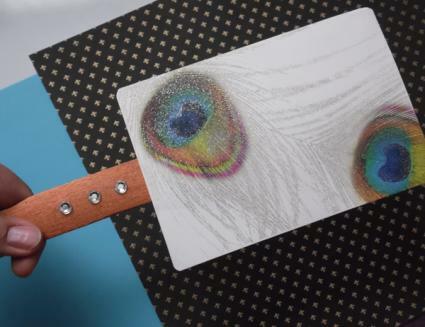 Apply a thin layer of glue to the top and right hand side of the card. Apply glue to the bottom portion of the card that isn't already covered by your paint stirrer. Close the card. Place a heavy book on top to keep it flat while the glue dries. Add self-adhesive rhinestones to the paint stirrer handle of your fan. If desired, use a corner rounder to round the edges of your card and give your fan a more contemporary look. 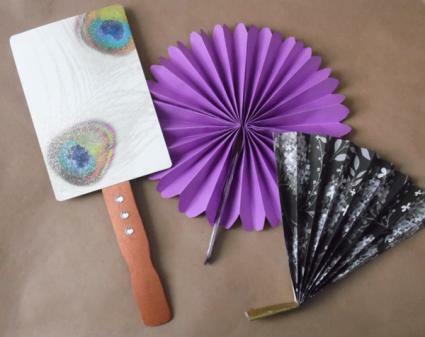 Paper fans are so easy to make that you can create a fan to match every outfit in your closet. With endless possibilities, think of them as summer's must-have fashion accessory.